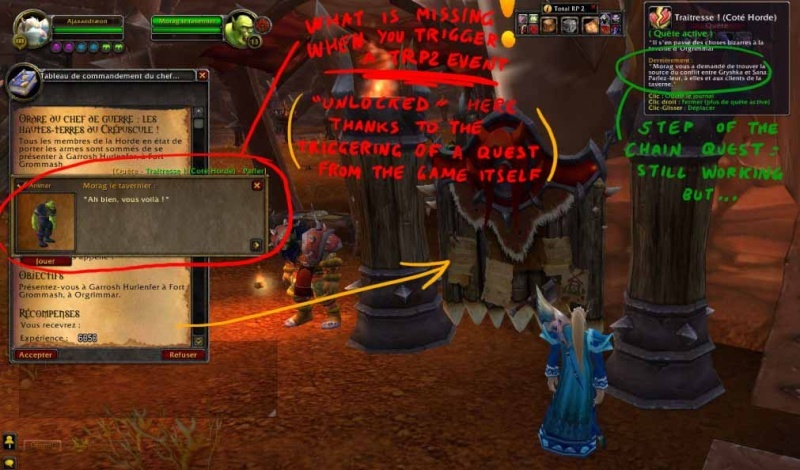 This issue has occured since WOW 5.0, when playing a TRP2-made quest, the text effects -such as alerts, instructions, NPC dialogues- do not appear any more, although other effects are working well (as far as i know). Thus one can play the quest chain... but not read it nor understand what is up. Okay, sorry for the delay. I had to sit down and test this myself. Fortunately yet unfortunately what I believe you're describing works for me. You have created an event trigger for a step/action and it seems that "Display text" effects don't work? (Which includes Chat Window, Pop-up, Warning, and Quest) Also, the example quest "Traitoress" has the same problem? I just found something interesting: the TRP2 Quest Window eventually shows up (too late...) when you take a "real" quest from the game. As an illustration, when i launched the horde-sided "Traitoress" quest, i was supposed to talk to the orkish barman, what i did, but "nothing" happened. At least nothing was displayed. I knew i was step+1 thanks to the little summary of the TRP2 Quest Button...but i could not see what the barman would have told. I know nothing about programming, but i hope this may help you guessing where the bug comes from. Aha! Thank you very much for the detailed information; this clears it right up. It's just the quest text box option, and I got that too, right down to the Warchief's Command Board causing it to trigger. This is a definite bug, so I'll add that to the list! For now, it would probably be best to use the other options until it's fixed.